Ecuador’s refusal to turn Assange over to the British threatens more turmoil between the US and newly independent Latin America. Julian Assange in Geneva. REUTERS. The British made a “huge mistake” in threatening to extract Julian Assange from Ecuador’s London embassy after the Latin American country granted political asylum to the WikiLeaks foundaer yesterday, says international human rights lawyer Michael Ratner. “They overstepped, looked like bullies, and made it into a big-power versus small-power conflict,” said Ratner, president of the Center for Constitutional Rights, in an interview with The Nation today. Ratner is a consultant to Assange’s legal team and recently spent a week in Ecuador for discussions of the case. The diplomatic standoff will have to be settled through negotiations or by the International Court of Justice at The Hague, Ratner said. “In my memory, no state has ever invaded another country’s embassy to seize someone who has been granted asylum,” he said, adding that there would be no logic in returning an individual to a power seeking to charge him for political reasons. Since Assange entered the Ecuadorian embassy seven weeks ago, Ecuadorian diplomats have sought the assurance through private talks with the British and Swedes that Assange will be protected from extradition to the United States, where he could face charges under the US Espionage Act. Such guarantees were refused, according to Ecuador’s foreign minister, Ricardo Patiño, who said in Quito that the British made an “explicit threat” to “assault our embassy” to take Assange. “We are not a British colony,” Patiño added. British Foreign Secretary William Hague said yesterday that his government will not permit safe passage for Assange, setting the stage for what may be a prolonged showdown. The United States has been silent on whether it plans to indict Assange and ultimately seek his extradition. Important lawmakers, like Senator Diane Feinstein, a chair of the Senate Intelligence Committee, have called for Assange’s indictment in recent weeks. But faced with strong objections from civil liberties and human rights advocates, the White House may prefer to avoid direct confrontation, leaving Assange entangled in disputes with the UK and Sweden over embarrassing charges of sexual misconduct in Sweden. 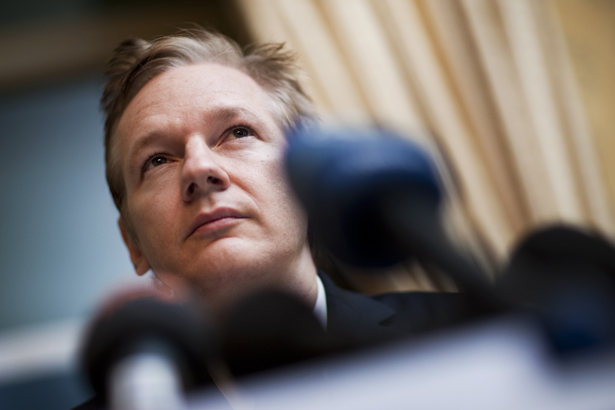 Any policy of isolating Assange may have failed now, as the conflict becomes one in which Ecuador—and a newly independent Latin America—stand off against the US and UK. Ecuador’s president Rafael Correa represents the wave of new nationalist leaders on the continent who have challenged the traditional US dominance over trade, security and regional decision-making. Correa joined the Venezuelan-founded Bolivarian Alternative for the Americas in June 2009, and closed the US military base in Ecuador in September 2009. His government fined Chevron for $8.6 billion for damages to the Amazon rainforest, in a case which Correa called “the most important in the history of the country.” He survived a coup attempt in 2010.